Early in 1967, Ossa made what turned out to be a very monumental decision. 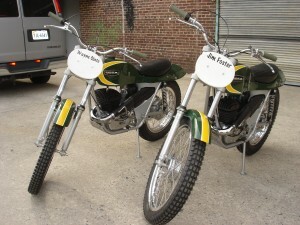 They were well behind their Bultaco and Montesa countrymen in observed trials because they had no purpose-built bikes. In order to develop one, they contracted with an English lad who was a fast rising star in the trials world, named Mick Andrews. He built the first prototypes out of the existing 231cc Pioneer trail bike, until he had one good enough to compete in the SSDT. He retired on the second day, but the factory had a trials bike to sell, the Ossa “Plonker”. Wayne Slate purchased this bike new from his good friend Jim Foster at Liberty Cycles in Randallstown, MD. After riding it for several years, he sold it to update his trials bike to a new MAR (he still owns it). Approximately 33 years later, Mike Slate (son) gets a call from Jim Foster. Jim purchased two 1970 Plonkers in rough shape. One came with a title – his dad’s original bike. Jim gave Mike the bike in exchange for restoring both of them.